When people get really sick or injured, they go to the hospital with the expectation that the doctors will be able to do something about their health problems. Considering how much medical technology has advanced just over the last century, we really take this expectation for granted. Amazing innovations have occurred from the early 20th century to today — some you might think about as having been around forever. However, this is nowhere near the case. Major medical developments occurred in recent years, and we’re going to highlight some of the most influential. Dutch physician Willem Einthoven was awarded the Nobel Prize in medicine for developing the first EKG machine, which was made of a string galvanometer. This made the EKG sensitive enough to detect electric waves traveling through body tissue and bone before it reached the skin. EKGs measure a heart’s electrical pulses and can thus help identify many health issues related to heart problems. The first modern respirator was nicknamed the “Iron Lung”; it was a large iron tank that used the power of vacuum cleaners to push and pull on the person’s chest. As shown in this picture, a person’s whole body was in the machine with the exception of his or her head (which is very different from today’s version!) This development was a huge stride toward the practical use of respirators, which are extremely important in medicine today. John Wild, often called the father of medical ultrasound, and John Reid found that soft biological tissue reflected sonic energy as echoes. 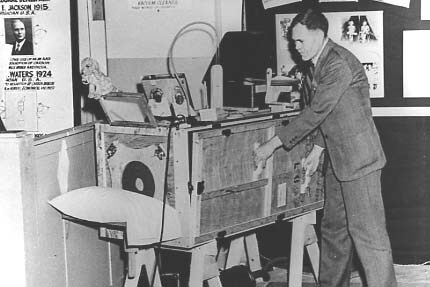 Wild used ultrasound technology to calculate the thickness of bowel tissue, and his discoveries about ultrasound led to the first real-time pictures of living tissue. Today, ultrasound is used to help doctors evaluate symptoms, study internal organs, assess the heart, and examine babies still in the womb. A functional, external pacemaker, developed by Paul M. Zoll, could be plugged into an electrical socket and stimulate the heart from the outside of the chest. However, unlike pacemakers today, the process was painful, and people using this pacemaker had to be sedated. Nowadays, pacemakers are put in the chest to control the heart’s rhythm, and newer versions can monitor blood temperature and breathing rate. This extremely important medical tool was introduced in the 1970s. CAT scans take detailed x-rays to form 3-D images of any part of a person’s body and detect elements that a normal x-ray couldn’t. While it was originally created to scan the brain, it’s currently used to scan different tissues, bones, and other organs, as well. When an ophthalmologist from New York City realized the Excimer laser could be used for correcting vision, he patented its use and performed the first laser surgery on a patient in the late 1980s. The technique was developed over the next decade until 1996, when the United States approved the refractive surgery. Now millions of people have the option of getting the surgery instead of wearing glasses or contacts for the rest of their lives. This 13-years-long project resulted in the first draft of the first human genome. Acquiring this extensive information about DNA helped doctors and researchers gain a better understanding of disorders and how they affect people. Applying this knowledge can assist us in preventing and treating different illnesses, and there have already been genes found to be associated with different diseases. In a miracle-esque fashion, there’s now a gun that can make people who are suffering from severe burns re-grow healthy skin in mere days. Basically, the gun uses healthy skin cells from the patient in a water solution and sprays the stem cells onto the wounded or dead skin. Then, a few days later, the skin’s grown back as if nothing ever happened in the first place! Over the last century, all kinds of medical procedures, techniques, and tools were created of which we take advantage. Some of these, like the EKG and the CT scan, barely seem as incredible as they must have been when they were first developed. But the innovation continues. Tools like the skin cell gun are just the beginning of a long list of amazing innovations occurring in our lifetimes. Medical equipment is crucial for keeping medical facilities germ-free and safe. There are many techniques to disinfect and sterilize equipment, using antibacterial soap, ultraviolet-light exposure and disinfectant solutions, such as bleach and intense heat.